On our path towards discovering the Romanian treasure on Mount Athos, we propose to highlight and edit the documents and manuscripts from the Zographou and Docheiariou monasteries, which are part of the largest documentary deposit for the medieval and modern history of the Romanian Principalities outside the Romanian borders. To this end, for around 15 years, the manager of this project has dedicated a great part of his scientific activity to the publication and valorisation of Romanian documents on Mount Athos. 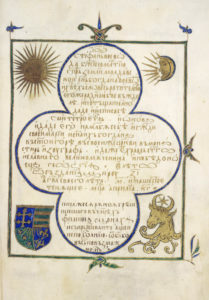 Ganze Seite: Text (Widmung in goldener Tinte), Mond, Auerochse und Sonne in Gold, Familienwappen der Fürsten in Blau, Grün und Gold. From a scientific perspective, the study of Romanian archives on Mount Athos has a great importance, being one of the few sources that could actually bring new information on the Romanians’ history and on the history of the entire Eastern Christendom. By publishing all the documents within two new Romanian archives on Mount Athos – the archive in the Zographou Monastery and the archive in the Docheiariou Monastery –, many fields of the Romanian and south-eastern European history will be enriched. Concerning the Zographou Monastery, we will also study the Romanian manuscripts preserved in the monastery’s library, and other testimonies attesting the Romanian donations for this Athonite monastery, because they have been scarcely studied or simply ignored thus far. The research of the relations between the Romanians and Mount Athos will contribute to a better understanding of the economic relations between the Romanian Principalities and the Holy Mountain (with larger connections in the Levantine and Ottoman world) and between the Romanian Principalities and Bulgaria (for the Zographou monastery). Furthermore, the publication of new information – kept in the monastery archives – may contribute to the restoration of the architecture and paintings of the ecclesiastic complexes on Mount Athos or in the Republic of Moldova, because they reveal their original shape and the subsequent additions. At the same time, these studies will help develop the cultural tourism and pilgrimage on Mount Athos, which have flourished since 1989. From a social standpoint, this project will help develop the skills of master students, PhD candidates and post-doctoral researchers and young researchers. By assimilating solid knowledge in the fields of Slavonic Paleography and Cyrillic Paleography, they will work independently and successfully in archives, museums and libraries, where they will be able to process the funds and collections of documents, manuscripts and old books. From a cultural perspective, after processing and publishing the two archive funds within the monasteries of Zographou and Docheiariou, around 1,300 documents regarding the medieval and modern history of Romanians will be included in the national and international scholarly circuit. This way, we will help complete the international bibliography concerning Mount Athos, making the contribution of Romanian researchers more visible. We will also develop an important centre of Romanian–Athonite research in Iaşi. The objectives of this project are as follows: publishing a volume of documents from the archive of the Zographou Monastery, according to the rules established by the prestigious collection “Archives de l’Athos”, in two editions (in Romanian and Bulgarian). To this end, the project manager along with I. Biliarsky, D. Peev and Gh. Lazăr have concluded a research agreement. 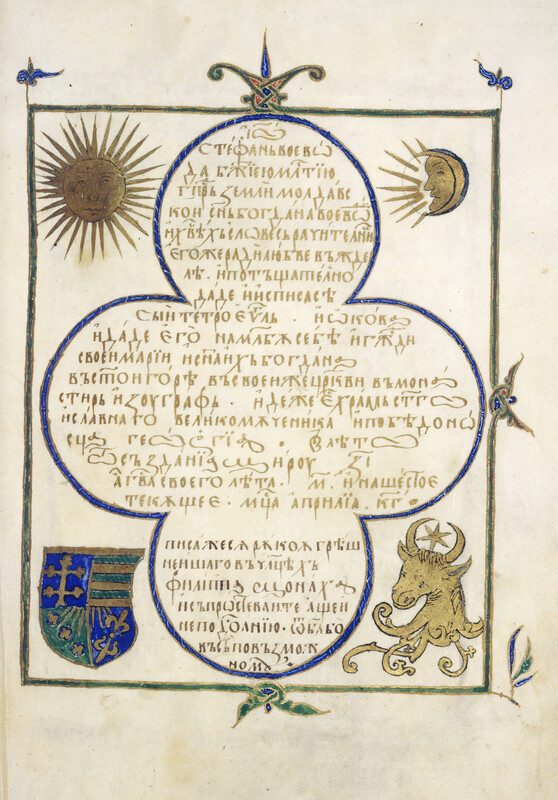 This agreement has been legally authenticated, but it excludes any type of financial support; through it, the Zographou Monastery agrees to make available the entire documentary and bibliographic material necessary, in exchange for publishing it in Romanian, in a highly regarded scientific format. Another objective is the publication of a volume of documents from the archive of the Docheiariou Monastery, with full text, archive description, notes, commentaries and index, according to the editing rules established by the national collection of sources DRH, series A and B. Concerning the Docheiariou Monastery, the collaboration between the project manager and Florin Marinescu enabled the monastery’s agreement for the full publication of the documents in Romanian, while the photocopies of these documents are in the Laboratory for the Research of the Relations between Romanian and Mount Athos, at the Faculty of History. Another objective is to analyze the relations of the Zographou and Docheiariou monasteries and of the entire Mount Athos with the Romanian Principalities, focusing on political, ecclesiastical, social and economic aspects and to publish case studies conducted after studying the documents, manuscripts and other categories of historical sources identified throughout the research. Another objective is to organize an international conference and to publish its studies in a volume, preferably in international languages and at a renowned publishing house in Romania and abroad. By attaining these objectives, we will introduce original information in the national and international scientific circuit, which will contribute to a better insight into the general history of Romanians and Bulgarians (concerning the Zographou Monastery) and into special aspects such as Church history, the history of towns across Moldavia (the old territory between the Pruth and the Dniestr included) and Walachia, the social and local history, etc. The research team is balanced: whereas the goal is to study the Romanian–Athonite relations, we wished to promote equal opportunity by including four men and three women within this project. The studies, articles and papers published highlighting the great number of unpublished documents and manuscripts from the archives and libraries of the Zographou and Docheiariou monasteries will help reveal the role played by Romanians on Mount Athos and the role played by the Holy Mountain in our history. After their publication, the Romanian historical research will be significantly more present in the international historical bibliography regarding the role and place of Mount Athos in the history of the Orthodox Church. In the following bibliography of Mount Athos, Romanian researchers will count much more contributions compared to the existing bibliographies.